An affiliate of one of the world’s biggest shipping companies will take over operations of the Port of Seattle’s Terminal 46, just west of the stadiums. 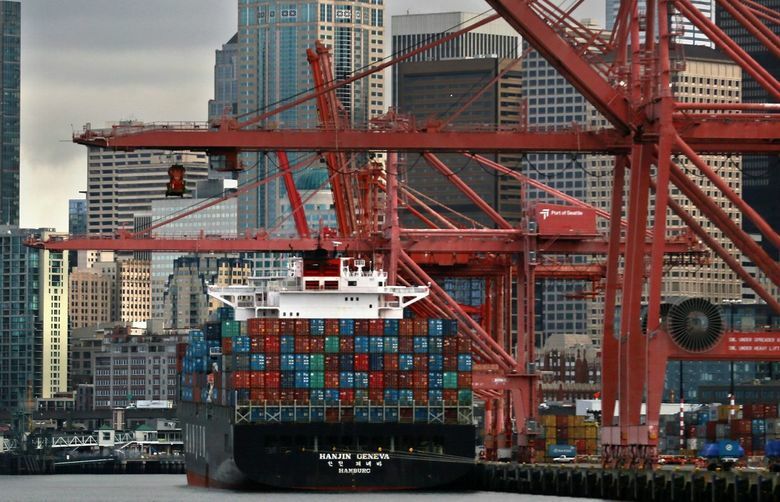 Months after a major shipper to the Port of Seattle declared bankruptcy, the company is selling its local terminal operations to one of the world’s largest cargo firms. South Korea’s Hanjin Shipping, one of three major companies that calls on Seattle’s Terminal 46 near the stadiums, filed for bankruptcy protection at the end of August, worrying local retailers about the fate of their cargo. Hanjin had been delivering about three major shipments per week to the Port — nearly one-third of the traffic at Terminal 46 — and owned the company that operated the terminal. But now Hanjin has agreed to sell its majority stake in the terminal operating companies at the Seattle and Long Beach, Calif., ports for $78 million, according to bankruptcy court filings from last week. The deal doesn’t spell out the cost breakdown between the two ports, though the Long Beach facility is more than four times bigger than the Seattle terminal. Hanjin owns 54 percent of Total Terminals International, the company that operates the Terminal 46. The new owner is Luxembourg-based Terminal Investment Limited, an affiliate of Switzerland-based Mediterranean Shipping, one of the biggest shipping companies in the world. The firm helps operate about 30 terminals around the world and already owned the 46 percent of Total Terminals International not owned by Hanjin. Terminal Investment plans to eventually sell a portion of the Seattle operations to South Korea’s Hyundai Merchant Marine. As part of the Hanjin deal, the new owner is forgiving a $54.6 million outstanding balance due from Hanjin and taking on $202.9 million in debt, which is a big reason why the $78 million purchase price was so low. Alistair Baillie, president of Terminal Investment, said there won’t be any changes made to Seattle terminal operations and that the company will simply take over the business from Hanjin. Its parent, Mediterranean, had already generated about half the cargo volume at the Terminal 46 facility and is now one of only two major shippers left there, along with Maersk. Nick Demerice, a spokesman for the Northwest Seaport Alliance, which controls the Seattle Port, said officials there were still trying to make sense of the deal but early indications were that it was good news. “Stability is obviously a positive outcome for the ongoing work at Terminal 46,” Demerice said. The Long Beach port has already approved its part of the deal, but Port of Seattle officials have yet to sign off. A U.S. bankruptcy-court judge in New Jersey must also approve the transaction. Hanjin did not respond to requests for comment.